ROUYN-NORANDA, QC, Feb. 2, 2017 /CNW/ - Granada Gold Mine (TSX-V: GGM) (OTC: GBBFF) (Frankfurt: B6D) (the "Company" or "Granada") today announced plans to drill test the thickness of mineralization under the porphyry intrusion between Old Pit #1 and the 2014 Preliminary Feasibility Study (PFS) Pit at the Granada Gold Property near Rouyn-Noranda, Quebec. The drill test is to obtain additional data for the new geological model being developed on an on-going basis by geological consultants GoldMinds Geoservices Inc. 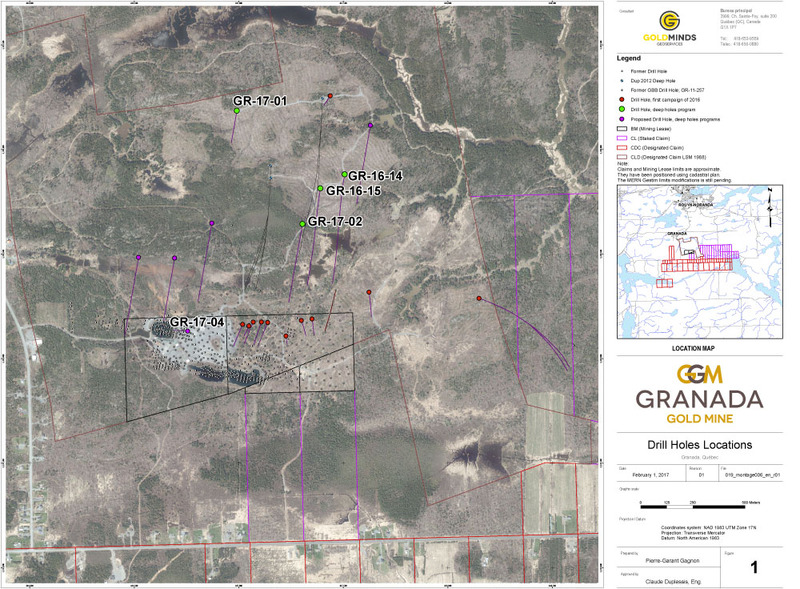 The drill that has been operating at the property since December 2016 is currently being moved to location GR-17-04 to conduct the drill test to a depth of approximately 120 metres. It will be the first time that a hole will be drilled toward the west to assess a revised mineralization model in that sector of the property. After completion of this relatively shallow hole, the drill will be moved to a location to the north to continue the 8,000-metre, deep-hole program announced last December. As part of the deep-hole program, 3,690 meters have been drilled to date, including GR-16-14 for 924 meters, GR-16-15 for 891 meters, GR-17-01 for 1,278 meters, and GR-17-02 for 597 meters. These four holes drilled to date intersected mineralization with smokey quartz veining and favorable alteration associated with pyrite, arsenopyrite and galena. The Company announced preliminary assay results for GR-16-14 in a news release on January 18, 2017. Assay results for the other holes are pending and will be released once received and validated.